This year's biggest first person shooter game is here and it has come in much the same format as its predecessors. Call of Duty: Black Ops is another linear first person shooter with a forgettable B-movie script that only serves as an excuse for a lot of shooting and explosions. All you need to know to get some fun out of this is that there are guns and there are bad guys. The main attraction of this game has to be its popular multiplayer component for most, which I've already covered in a separate review. This review then, will focus on the obligatory singleplayer campaign and revived zombie co-op mode. Because while most gamers seem interested in multiplayer almost exclusively, that does not appear to be the case for Treyarch which has put a lot of work into Black Ops' singleplayer components. Call of Duty: Black Ops starts you off in the sweaty shoes of SOG operative Alex Mason, who is currently being interrogated for information. The game's missions then are a myriad of flashbacks viewed from either Alex Mason's perspective or people in close contact with him and span various conflicts during the Cold War era ranging from 1945 to 1968. This offers Treyarch a nice excuse to present widely varied scenarios in completely different environments ranging from the hot jungles of Vietnam to the frozen Arctic Circle. The various missions eventually all tie in to each other with a fairly predictable B-movie plot, but that's already a major victory for the Call of Duty franchise. Previous Call of Duty games tended to suffer from the faceless hero syndrome, which saw half a dozen random heroes in random battles doing random things that had no real relation with each other. Black Ops then is the first Call of Duty game to actually present a moderately coherent - and memorable - plot. It may not be a very original plot with its deadly toxins, brainwashing and a Russian plan for invasion of America, but at least it's something. Visually, Black Ops is more than a bit dated. It's certainly no match for any recent PC game in terms of texture quality, environmental details or even particle effects. The only stand-out aspect is its excellent animation quality, which is probably the most believable I've seen to date. The ridiculously high minimum system specifications scream of a rushed port job with no PC optimization whatsoever, because they're higher than any other game released to date. 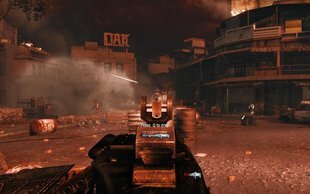 PCs that can run Crysis or Grand Theft Auto IV comfortably in medium detail will have trouble running Black Ops, despite its utterly inferior graphics. And Treyarch has been similarly lacks in polishing their game for optimal playability. Call of Duty: Black Ops suffers from a myriad of bugs both small and game-breaking. As of the latest patch it even has a tendency to freeze up randomly in the singleplayer component, be that in the main menu or the middle of a mission. And other small bugs tend to break action as well, such as friendly NPCs getting stuck in doorways, blocking your progress. There are even achievement bugs, for instance, in one mission you're challenged to make it through the helicopter section with missiles only. I only got the achievement upon the second attempt, despite not once using the minigun during my first attempt. The game also suffers from the same inherent design flaw as its predecessors: heavy handed scripting. In an attempt to offer a continuous stream of action-packed and memorable moments the game is entirely scripted from beginning to end. At times this results in awesome moments like running through an avalanche on a snowy mountainside with debris and snow falling all around you, but most of the time it results in frustration when a scene doesn't play out exactly like the designer wants and you get punished for it. This heavy scripting also means that enemies respond the same way every time, which makes the replayability value of this singleplayer campaign exactly zero. At times Black Ops also sees some serious lack of direction. The worst offender has to be the battle of Khe Sanh in Vietnam, where the Americans are trying to push back endless waves of Vietnamese soldiers. At one point in the mission the player is told to proceed to the bottom of a hill, but the real objective lies just a ridge higher in the form of barrels filled with napalm. These are never marked, instead the ground below is, so it never becomes obvious that the player is supposed to cut these barrels open and kick them down towards the Vietnamese soldiers. Add in the fact that those Vietnamese soldiers are on the Infinity Ward patented "infinite respawn" life insurance policy and you've got a formula for extreme frustration. And yet, despite all those complaints, I did have a fairly good time with Call of Duty: Black Ops. It's reminiscent of your average summer action movie in that it presents a forgettable plot and doesn't really execute it all that well, but there's a ton of explosions and gunfire that provide unsophisticated entertainment value all on their own. And Black Ops' presentation of these straightforward action scenes is much better than that of its predecessors. This is mainly due to the diversity in weaponry and missions. Not only does the game pass through a wide variety of locations, but you're handed new, unique and effective weaponry at every turn: shotguns with incendiary shells, crossbows firing semtex-tipped bolts, AK-74?s with flamethrower attachments, etc. Meanwhile every bad guy you run into also carries his own customized weaponry with its own attachments ranging from red dot sights to under-barrel grenade launchers. This spices the basic first person shooter gameplay up with some variety, in spite of the restrictive scripting and linear path the game takes you on. This variety also extends to how missions progress, because they're not nearly as static as in your average first person shooter. A mission may start in Mason's shoes, but that doesn't mean you'll be on foot by the end of the missions, or even in Mason's shoes. A stand-out mission is one that switches between a blackbird pilot, console operator onboard said blackbird and CIA agent Hudson on the ground in the middle of a raging blizzard. Another impressively varied mission is one that switches between Mason stealthily infilitrating a Russian compound only to have Hudson simultaneously advance on that compound with a large convoy of armed vehicles. The latter mission also has an interesting sequence where you fight through clouds of deadly gas inside hazmat suits, which forces you to use infrared scopes and be extra careful, because a leak means instant death and auto-health regeneration is disabled for that portion of the mission. And Treyarch shows similar ingenuity in the way they have built on the semi-interactive cutscenes and great use of camera movement seen in Modern Warfare 2. They use the camera to great effect to immerse the player in the situation, be that by shoving the player down to the floor after an explosion or having them absail from a mountain, it all seems very realistic in terms of perspectives and animation. The cutscenes also tend to be entirely in first person perspective with limited control over the camera, which greatly enhances the experience. Add in a few well-time quick time events, such as arming a grenade and attaching it to a Vietnamese soldier's uniform before pushing him back and you've got the most immersive Call of Duty shooter to date. It's too bad then that the infinite respawns, unclear objectives and poor scripting tend to fight against that immersion at every turn. Cooperative play is very popular nowadays, so it's no surprise to see Treyarch fall back on their fan-favorite co-op mode from World at War: zombie co-op. In this game mode up to four players fight off endless waves of zombies, while earning money for each zombie killed and barricade reconstructed. This money can then be spent on buying new weapons of the walls, upgrading existing weapons or opening up new areas of the map which contain new weapons or upgrades, but also increase the stream of zombies. It's a bit like Killing Floor, but with slightly more emphasis on exploring the map. The zombie co-op mode is still fun to play like it was in World at War, but hasn't really progressed much beyond that and certainly doesn't stand up well in comparisons with Left 4 Dead or Killing Floor. Treyarch has further gimped this zombie co-op mode by only including one remake from World at War and a new map that's only unlocked after beating the singleplayer campaign. There's also a top-down arcade zombie shooter to be played in co-op, which can be unlocked in the main menu, but other than that there's just not much to see here. I should note that the new map included in zombie co-op is a lot of fun. 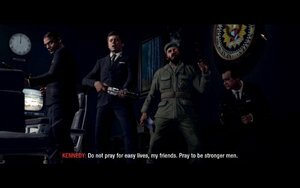 It's called Five and sees John F. Kennedy, Richard Nixon, Robert McNamara and Fidel Castro working together to defend the Pentagon from a relentless horde of zombies. It's certainly worth playing at least once, if only for the hilarous one-liners, but it doesn't really compensate for the severe lack of co-op content. Then there's also the added problem that zombie co-op used a local host system similar to Modern Warfare 2, so there are numerous unresolved connection issues that hamper zombie co-op play. Call of Duty: Black Ops is a mixed bag of great improvements to the Call of Duty formula and glaring design oversights. The singleplayer campaign presents a less forgettable experience than its predecessors, but still doesn't match up to the more memorable of first person shooters. And in the meanwhile the myriad of bugs and heavy-handed scripting have a good chance of ruining the experience for a majority of players. There's an okay shooter to be found here, but Black Ops' real value clearly lies in its two distinct multiplayer components. The zombie mode is entertaining and the new map is hilarious, but it's all a bit limited and suffers from a local host setup similar to Modern Warfare 2. The real star of the show is the normal multiplayer component, which is certainly the most popular PC multiplayer shooter right now. That too suffers from numerous bugs and ridiculously poor performance, so Black Ops is not for everyone. But if you're a fan of the franchise and have a powerful computer, then this is one shooter you'll certainly want to play. Otherwise, it's nothing more than another mediocre first person shooter.